HD inspired pretty much everyone to buy a new TV, but then the manufacturers faced a problem -- what next? They banked on 3D, but people balked, and the technology failed to capture interest with pretty much everyone. As you may already know, Roku has jumped into the TV market now, pumped up by the possibilities for the future of the platform. The set-top box maker hasn't jumped into the business with its own OEM, but has licensed its software to power the latest big screens in your home. Now the latest model is hitting the market, this one rolling out from Hitachi, a big name brand in the electronics market. The new models range from 50 inches up to 65, and prices vary from $499 to $999. The models -- the 50R8, 55R7 and 65R8 -- feature more than 3,500 streaming channels, including 350,000-plus movies and TV episodes, and a 4K Spotlight channel that offers curated 4K content making it easy to access the video from Netflix, Amazon Video, FandangoNOW and 10-plus other streaming channels. Roku claims "It's been a great year for Roku TV thus far. In the first half of 2016 we captured 12 percent of the US smart TV market share, up from 8 percent at the end of 2015. 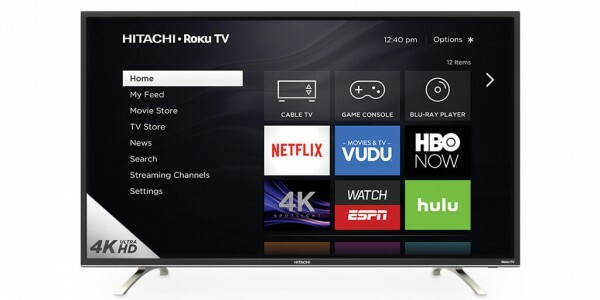 With Hitachi on board we will launch 100 Roku TV models in North America this year". All three of the Hitachi Roku models are available starting this week.